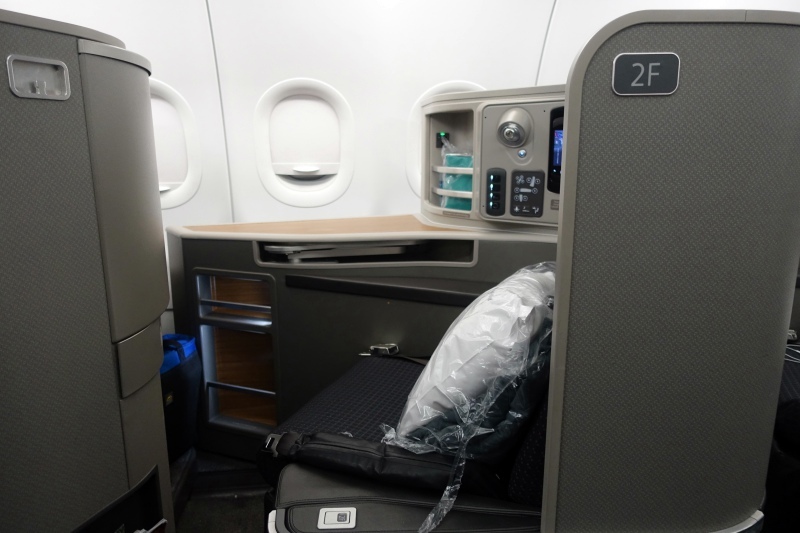 This Review of American First Class on the A321 (32B) Transcon from SFO to New York JFK is one of several AA A321 reviews. 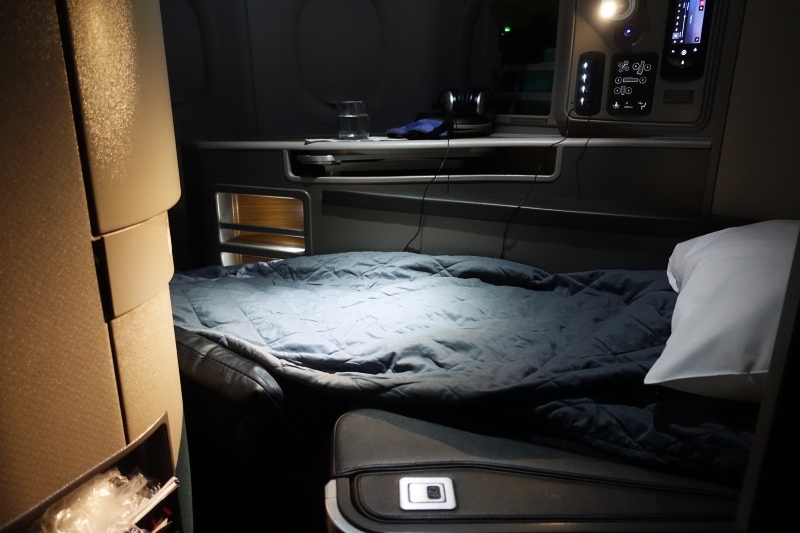 For others, see my husband's American A321 First Class Review JFK to LAX and my prior American A321 First Class San Francisco to New York JFK Review. Since our prior reviews covered American's A321 First Class Cabin and Seat Selection, I'll just quickly summarize the cabin and seat. American's A321 transcontinental first class cabin has 10 first class seats in a 1-1 configuration with seats angled toward the window, which is great since each seat has both a window and direct aisle access. As usual, I'd avoid the first row, row 1, and the last row, row 5, to minimize light and noise disturbance from the galley and lavatories. Each first class seat is 21 inches wide, so about a couple inches wider than business class, and is supposed to recline to a fully flat bed, although the lower part where your legs and feet are actually slopes downward slightly and isn't perfectly flat–more on this below. 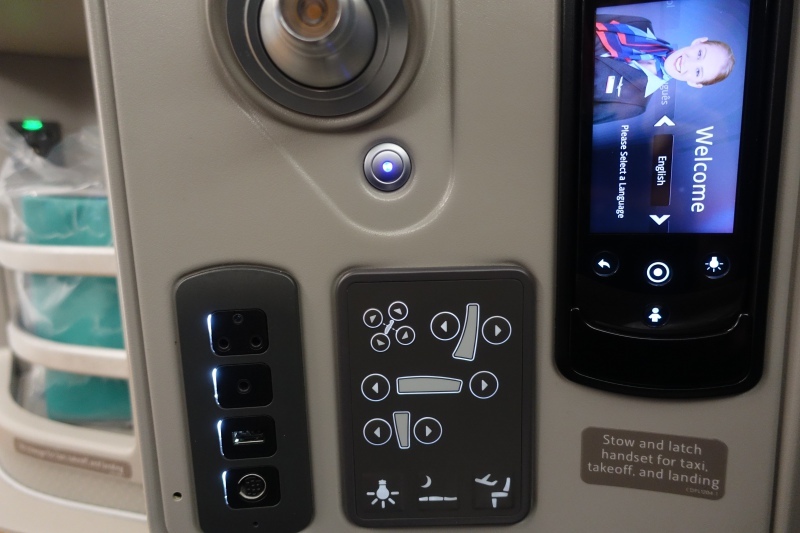 The manual seat controls are easy to use, and are located by the in-flight entertainment controls. 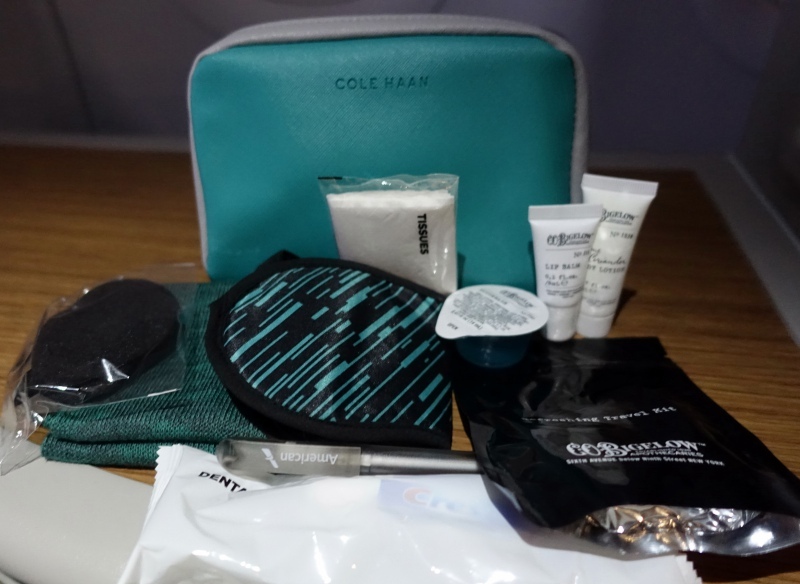 It's also easy to find the power outlet, which is in the small storage compartment where there's Dasani bottled water and a Cole Haan amenity kit with CO Bigelow lime and coriander body lotion and lip balm, along with a dental kit, sleep mask, socks, tissues, and ballpoint pen. Unfortunately no slippers are provided, however. 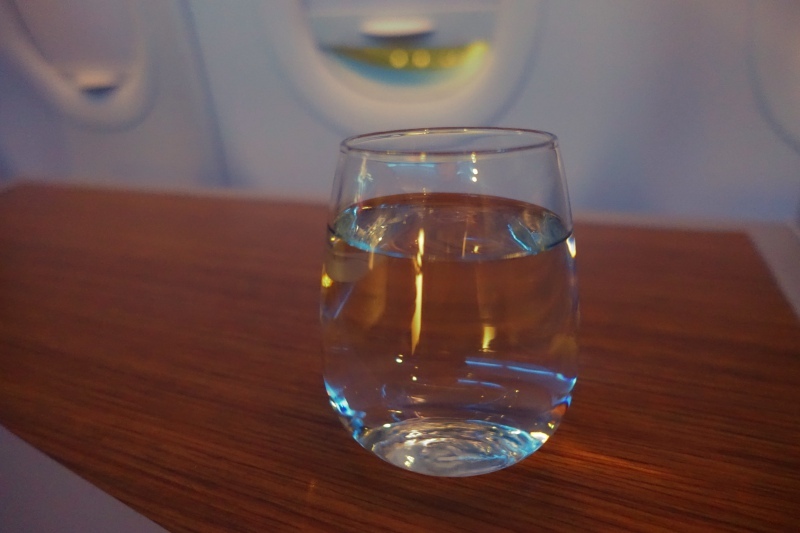 Before we pushed back we were offered a pre-flight drink, and as usual I had some water. This was a red eye flight, so honestly I wasn't expecting much in the way of food. But to my surprise there was a menu and it even featured menu selections designed by celebrity chef and fellow Hawaiian Sam Choy, known for his creative Pacific Rim and Hawaii regional cuisine. I didn't want to miss out on trying something from the menu, so I ditched my plan to sleep for the entire flight. We were then offered another drink, along with mixed nuts. 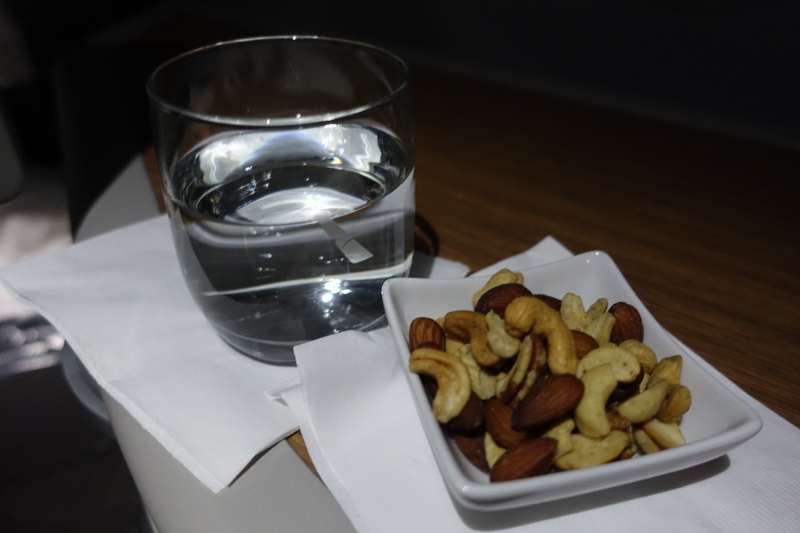 Unlike most of my prior United BusinessFirst flights, the mixed nuts were room temperature, not warmed up. The meal on this red eye flight was easily the best I've had on any U.S. domestic flight. Sure, you can say that it's hard to go wrong with fresh burrata cheese, but I still give credit to AA for collaborating with Sam Choy and for putting burrata cheese on the menu. 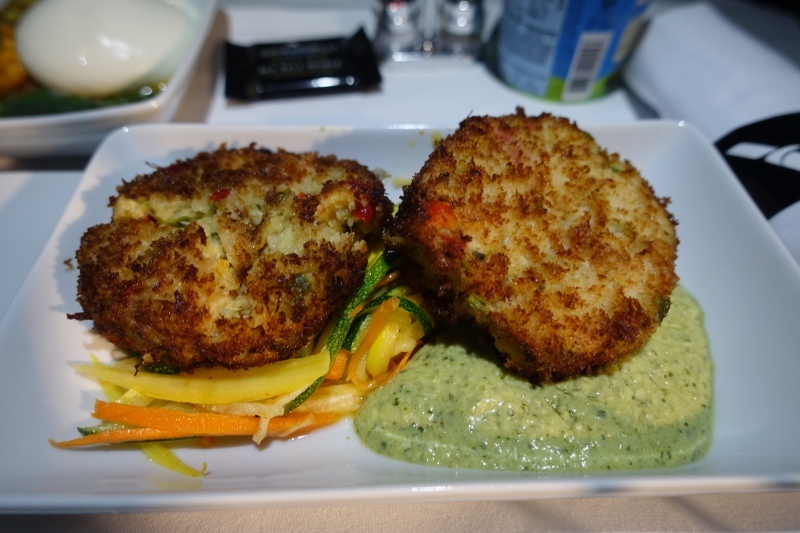 And the Pan Seared Crab Cakes with jicama slaw and tomatillo poblano cream sauce were fantastic–I would happily return to any restaurant serving these. 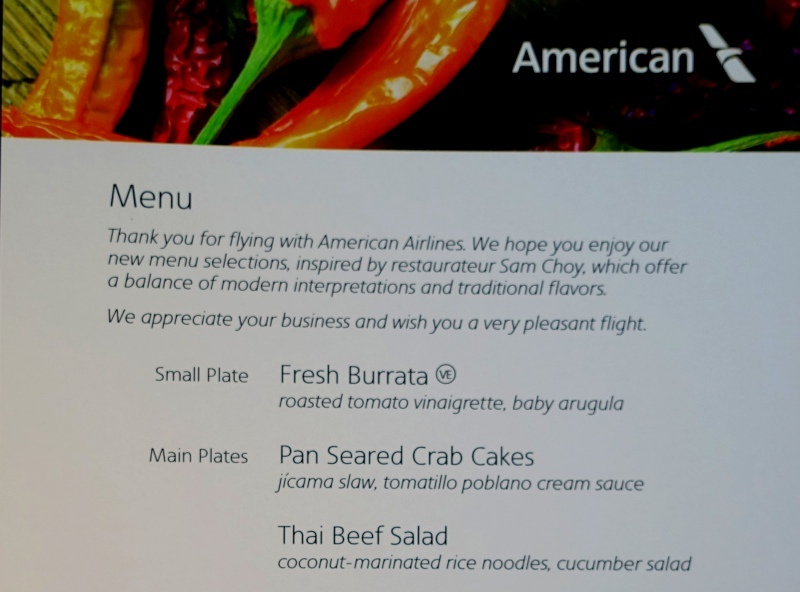 I've no idea how the other entrees, the Thai Beef Salad and Vegetarian Cremini Bolgnese were, but if you like crab cakes and see these on your AA flight, order them. 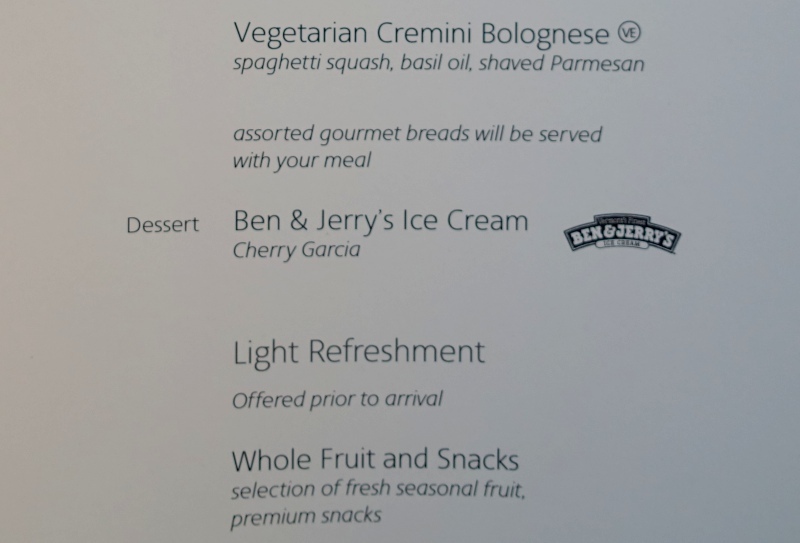 Dessert was Ben & Jerry's Cherry Garcia ice cream, not a sundae, but that makes perfect sense to me on a night flight when most want to get some sleep anyway and not wait for sundaes to be served. 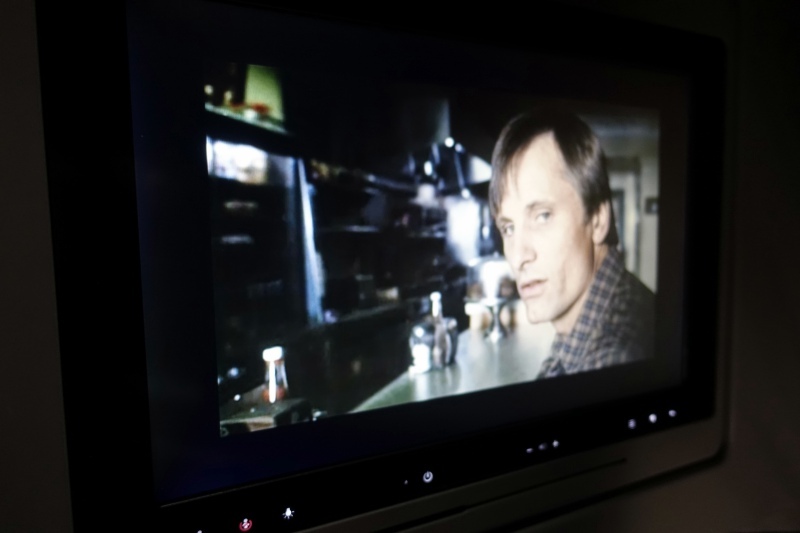 American provides Bose noise cancelling headphones in first class, and the IFE is of course the same in all classes of service. I watched the trailer for a History of Violence, with Viggo Mortensen, but knew I wouldn't be able to stomach many of the scenes of the full film. What I dislike is that AA forces you to return your headphones about 30-45 minutes before the flight ends, which is exactly when, on a red eye flight, you'd want to watch since you have to return your seat to its upright position for landing. 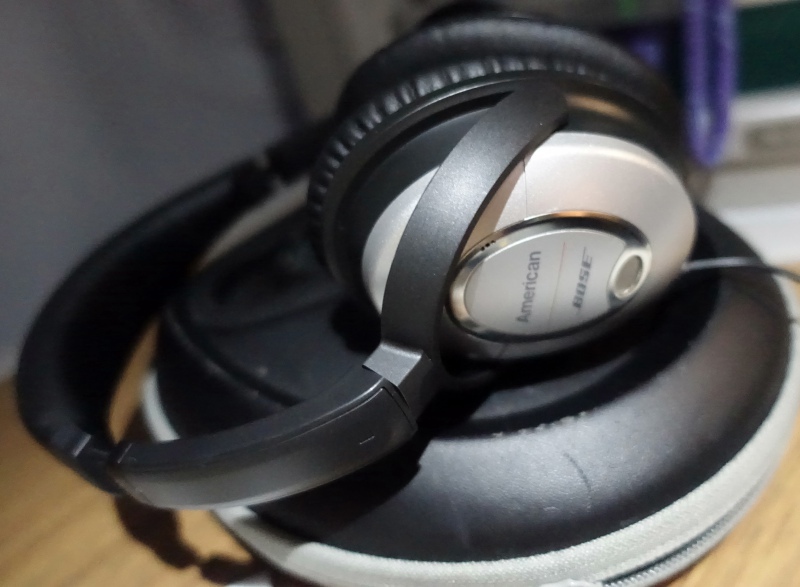 While it's undoubtedly easier for AA to have all the headphones collected to minimize what crew have to do once the flight lands, I do think they should try to make an exception at least for first class, since it's only 10 seats. 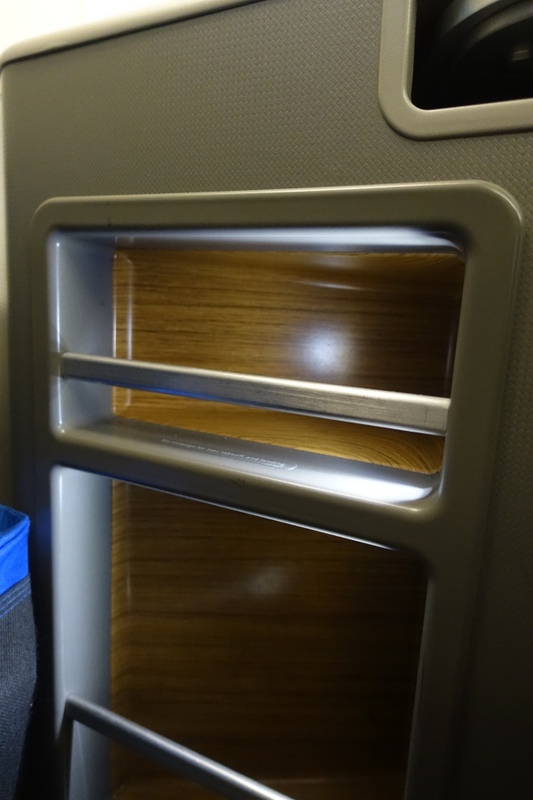 As our prior reviews have pointed out, American's A321 first class seat is mostly flat, but the lower section of it, which meets up with the shelf under the IFE to form the foot of the bed, is actually slightly angled, so it's not as perfectly flat as AA's Business Class seat on the same A321. This may or may not bother you, but it's worth being aware of. 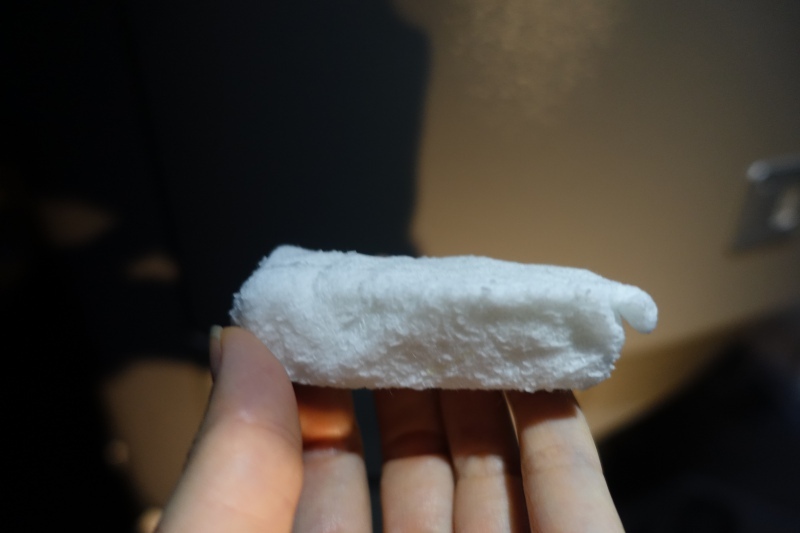 I always find airline beds too firm (except for Singapore Suites and JAL First Class and Business Class) so I used the duvet as a kind of mattress pad. Even with a sleep aid I only got a couple hours of sleep, but that's certainly better than nothing, and even being able to rest on a flat bed is very welcome on a red eye flight. 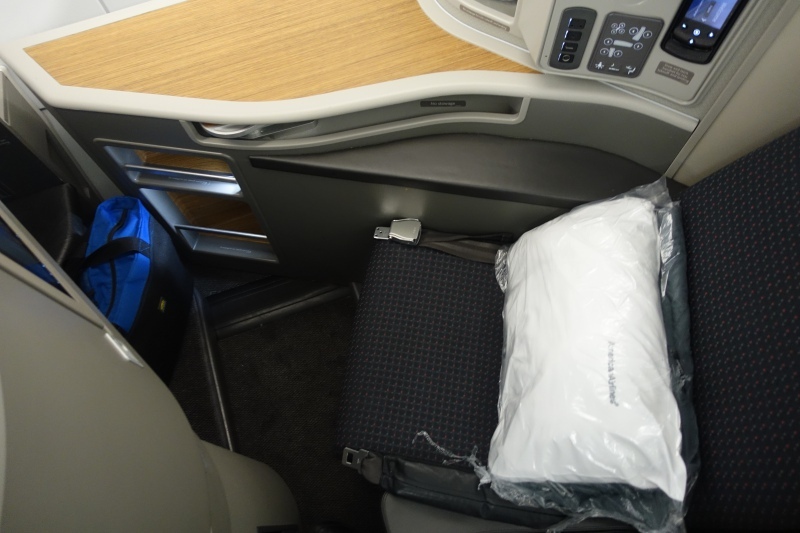 It's not surprising that American, with its 2016 Award Chart Devaluation, increased the miles required for its A321 (32B) transcon flights vs. the old recliner first class, and also sharply reduced the saver award space. The products are so different from each other they might as well be different airlines. 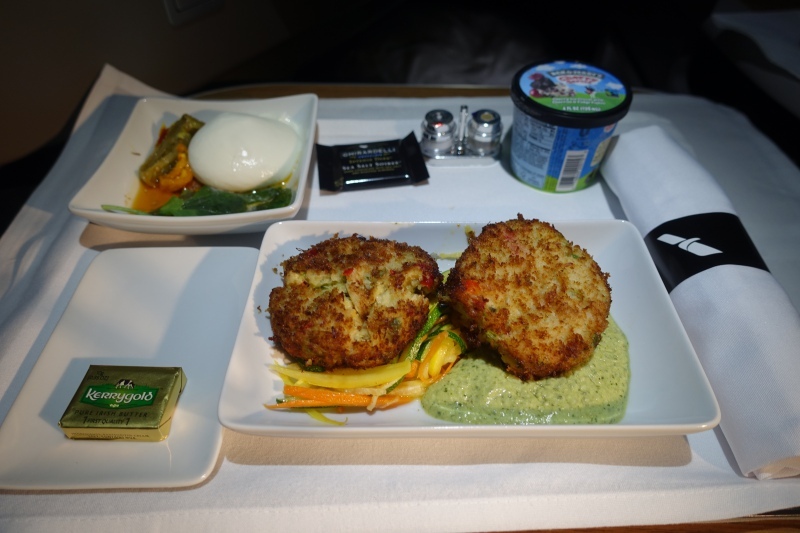 In particular I was impressed with the meal quality on this red eye flight, due to the Sam Choy burrata appetizer and seared crab cakes main dish. As fantastic as this was, however, I'm unlikely to pay for this product unless it's similarly priced to JetBlue Mint, which in my experience is always less expensive, at least when purchased well in advance. 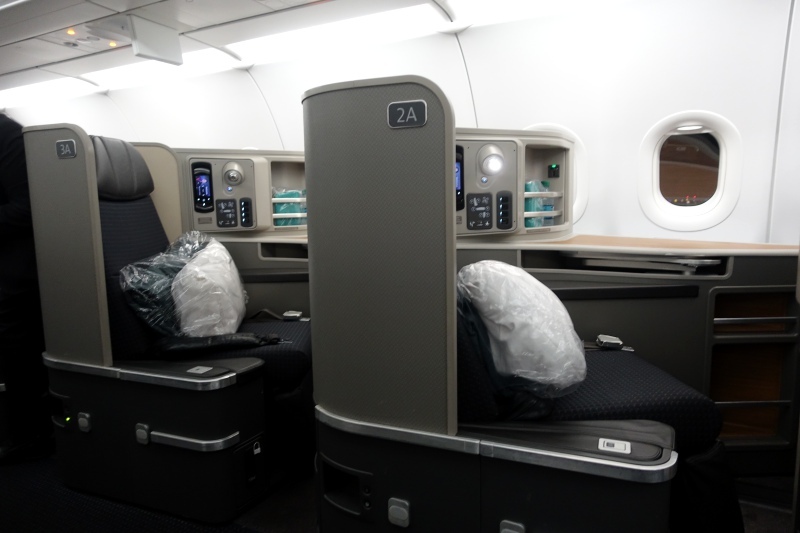 If you've flown American A321 transcon in first class recently, what was your experience? Become a TravelSort Client and Book Your Luxury Hotel with Virtuoso or Four Seasons Preferred Partner Benefits!